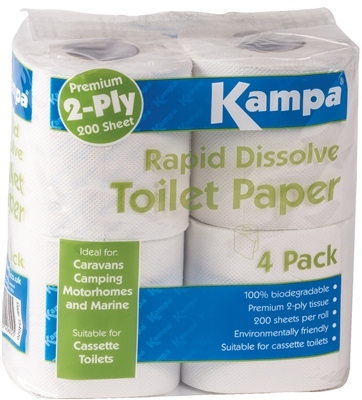 Kampa Rapid Dissolve toilet paper is specially designed for fixed and portable toilets. Soft and strong like any quality toilet tissue, it has the added benefit of breaking down quickly and easily in water. Rapid dissolve for caravan and camping use. Also ideal for marine use. Great stuff! Breaks down really well does what it says.